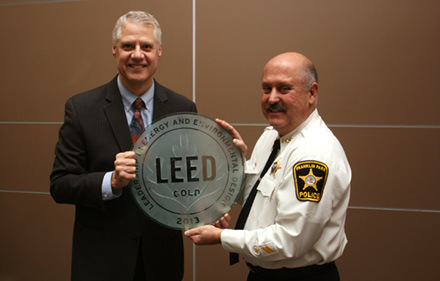 Franklin Park, IL – Mayor Barrett Pedersen and Police Chief Michael Witz officially received LEED certification at the Gold level by the U.S. Green Building Council (USGBC) at today’s Village Board meeting. Also participating in the presentation were the Village’s partners in this development, FGM Architects and MTI Construction Services. LEED Gold certification was achieved by implementing sustainable design features to optimize energy performance, reduce water-usage and incorporate regional materials and recycled content into the project. "We are thrilled that the USGBC has designated LEED Gold certification to the police station," stated Mayor Barrett Pedersen. "Sustainable goals were a priority for the project and we worked hard to incorporate innovative, sustainable energy features into the design and construction of the facility. We set the bar high and we have succeeded in making this new police station a model of sustainability for the region." "I am proud that we were able to achieve LEED Gold certification with the construction of our new police station," stated Police Chief Michael Witz. "These sustainable features will save energy and reduce costs for our police department. It has also created a healthier environment for our officers and staff who work there and for the visiting public." The new 36,500 square foot building incorporated innovative, sustainable energy features, including a high efficiency ventilation system and LED lighting systems with motion switches in every room, which help to reduce energy costs. Local and recycled materials were utilized during construction. Rainwater from the roof is collected into a cistern and used for irrigation and in the public restroom fixtures to reduce water use. Permeable pavers and porous pavement were utilized in the driveway and parking lot to limit runoff and therefore reduce sewer overflows. These permeable surfaces also help to reduce the heat island effect. Wetland detention basins improve water quality and reduce peak flows from the site, which reduce combined sewer overflows to the Des Plaines River. Bio-swales capture storm-water runoff along the railroad tracks and filter the runoff before it enters the wetland detention basins. The bio-swales absorb storm-water as it flows through native vegetation and remove pollutants including heavy metals and oil and grease. A $985,000 Illinois Environmental Protection Agency (IEPA) grant awarded to the Village in 2012 allowed for the creation of cutting edge storm-water management practices which utilize green infrastructure to capture, filter, infiltrate and detain storm-water runoff. "The IEPA grant assisted us to incorporate state-of-the-art storm water management practices and the positive effects of all these improvements will benefit the entire region," said Mayor Pedersen. "The IEPA grant moved us a long way towards making this facility an example of sustainable living." LEED is an internationally recognized standard of sustainable design practices. LEED provides building owners and operators with a framework for identifying and implementing practical and measurable green building design, construction, operations and maintenance solutions. LEED certification provides independent, third-party verification that a building, home or community was designed and built using strategies aimed at achieving high performance in key areas of human and environmental health: sustainable site development, water savings, energy efficiency, materials selection and indoor environmental quality. "The Village of Franklin Park is committed to our environmental health and has undertaken many initiatives that work toward sustaining our environment and our economy with renewable, sustainable practices," added Pedersen. "This was a collaborative project and we have our Board of Trustees, our dedicated staff and all our public and private partners to thank for making this facility a reality." What removal service do we receive from Allied Waste and how much does it cost? What can be done about stopped trains?